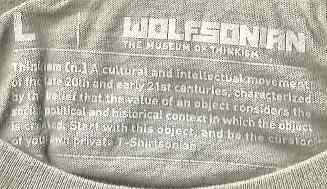 From the Wolfsonian, the self-appointed “museum of Thinkism.” Not sure when they created this shirt, sold at their Miami Beach museum, but at least a couple of years ago. Thinkism [n.] A cultural and intellectual movement of the late 20th and early 21st centuries, characterized by the belief that the value of an object considers the social, political and historical context in which the object is created. 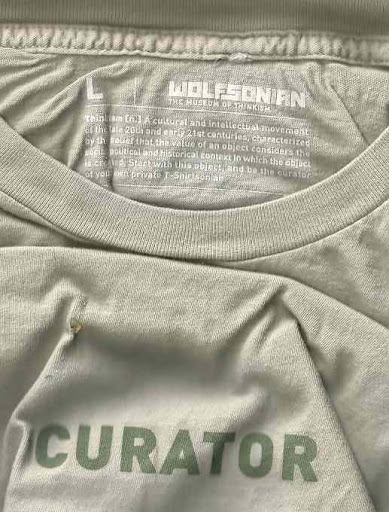 Start with this object, and be the curator of your own private T-Shirtsonian. The museum produces an arcanely fascinating annual publication called The Journal of Decorative and Propaganda Arts. The Thinkist curator can find value in almost any cultural artifact. Well, I suppose I should be grateful that they are object-based.